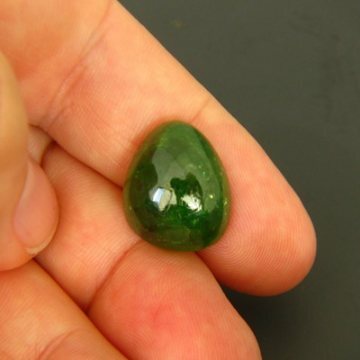 Comment: Massive cabochon of jungle-green grossularite garnet, coming from the famous Tsavorite fields. The intense green of this garnet family shows in one of the just-for-fun images under direct sunlight. DSEF certified (always 100% scientifically correct). In the handshot you can see the 'normal' rich green that has made grossularites one of the most expensive of all garnets in the last decade. Partly with a rainbow shimmer inside, called iridescence. First time we have such a cabochon in our stock. 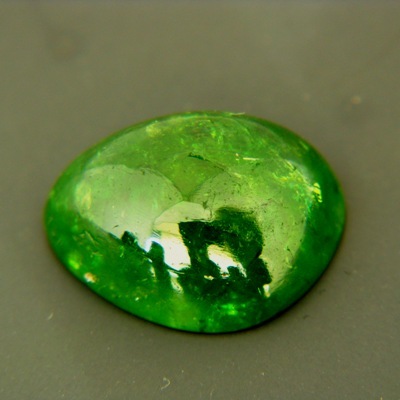 Usually green garnets are very small, 2 carats is big, but this is of course opaque material. Great buy for an individual rustic natural pendant without rival.